Rereading the Fantastic Four comics from the start. 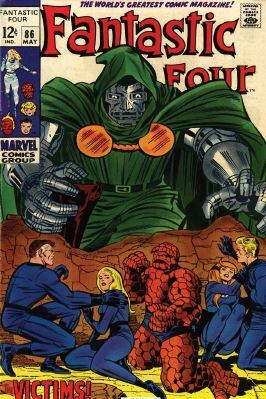 We’re still in Latveria in issue #86, with more machinations of Dr. Doom. Picking up where the last issue left off, the new and improved Doombots, the green ones, are marching toward the Latverian village where the FF are trapped. Our heroes can’t fight back because they’ve secretly been hypnotized into thinking their powers aren’t working. Got all that? The Latverians drop their happy-to-see-you act and ask the FF for help. Reed, ever the hero, decides that the FF will be the first line of defense, offering the Latverians at least a few seconds of relief as they attempt an escape. One of Doom’s monitors pops up and he addresses the people. This speech is good that I’m going to quote it in its entirety: “My robot army, which I created for your protection, is temporarily out of control! If you perish due to this regrettable accident, let it be known that your sovereign proclaims you heroes of the realm!” I love it. When confronted by Reed, Doom further speechifies that he’s giving the FF the privilege of dying among his subjects. 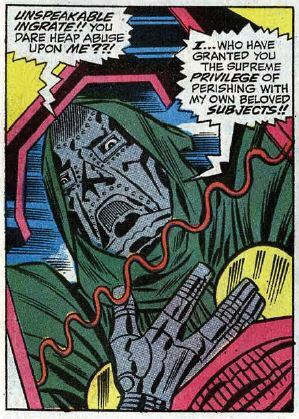 Then, once he’s alone, Doom admits that the green Doombots are indeed out of his control, but, as unstoppable as they seem, they have a weakness known only to him. The green Doombots reach the village. Ben declares that even without his powers, he’s no pantywaist, and he fights back, discovering that he still has his powers after all. 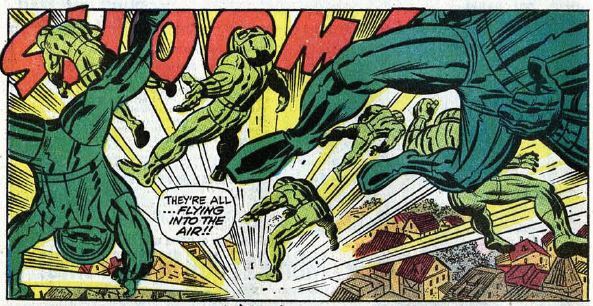 Even with his strength, though, the green Doombots are tough, and we get a bunch of panels of them fighting. Johnny fights back as well, his fire starting to return. The Latverians join the fight, having discovered a cache of weapons hidden by Doom (that was convenient). Reed believes that Doom wouldn’t have built the green Doombots without some sort of failsafe to stop them. 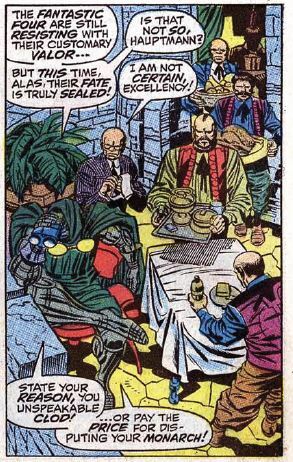 Inside Doom’s castle, Doom enjoys a fancy dinner while the battle rages outside. Doom’s toady Hauptmann, tells Doom not to overestimate the FF, but Doom won’t hear it. Back outside, Reed gets his powers back, correctly assuming that he’d been hypnotized. While escaping from the green Doombots, he discovers a hidden control unit inside one building. He uses it to switch all the robots off. Unstable molecule: Reed discovers the Doombots’ weakness mostly by accident, but he figures it out pretty quickly. He shows his courage by taking a stand against the robots to save the villagers. Fade out: It’s kind of random that Sue would show up out of nowhere like this, but it’s nice to see her being the hero and saving the day. 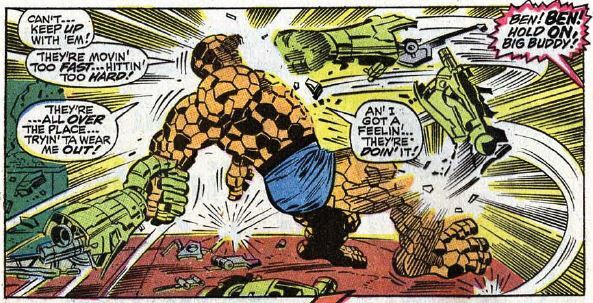 Clobberin’ time: Ben is the one who overcomes the hypnotism, merely by jumping into the battle. His fight with the Doombots is some great Kirby action. Flame on: Without his powers, Johnny climbs to a rooftop and acts as lookout. Even when powerless he finds a way to be the one in the sky. 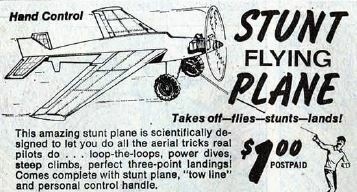 Commercial break: So, this thing’s just a big kite, is it? Trivia time: So just who is the Hauptmann guy? It’s Gustav Hauptmann, who formerly worked for the Nazis and for the Red Skull (WWII was still recent enough that stories could have characters like this). He’s the first of several members of the Hauptmann family who’ll show up here and there in Marvel history, usually causing trouble with mad science. Fantastic or frightful? 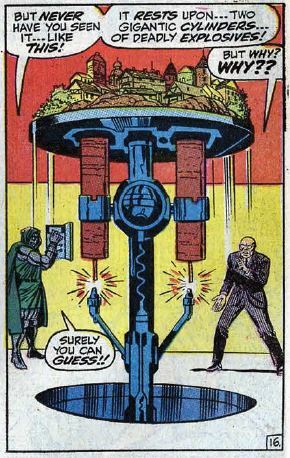 The fight against the Doombots is exciting, but the “control devices” are too simplistic a way to defeat them. (A giant fan?!?) What’s really great about this arc is the insight into Doom’s character. He’s completely full of himself and absolutely certain of his victory, and when things don’t go his way he loses his mind. It’s not his scientific wizardry or even his ambition that makes Dr. Doom dangerous, it’s his pride. We’ll see even more of this in the next issue.